In the last six months, VCs have invested more than $57B according to Mattermark data, which puts 2015 on pace to exceed 2000 as the year the most venture capital will be deployed, ever. Which sectors are benefitting from all these venture dollars? 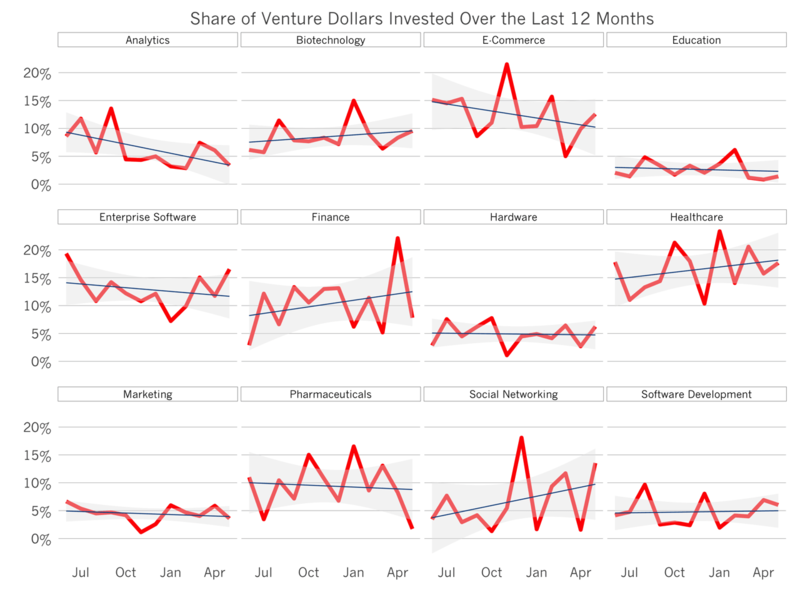 The chart above contrasts the top 12 sectors receiving venture funding in the US, and plots the relative share of dollars invested by month. The red line indicates the monthly data point, the thin blue line shows a linear regression trend line, and the shadow around the blue line is the area of standard error. Sectors receiving an increasing amount of investment include biotechnology, financial technology, healthcare, and social networking. Meanwhile, analytics and commerce companies are raising less as a fraction of total dollars than they have in the past. If we compare the seed investment patterns to the growth investment patterns, a few other trends pop out of the data. For example, although eCommerce companies raise more than 15% of the seed dollars in the past 12 months, the sector has raised a smaller share - 11% of growth investments. In contrast, enterprise software companies punch below their weight in seed investments, but above their weight in growth dollars. 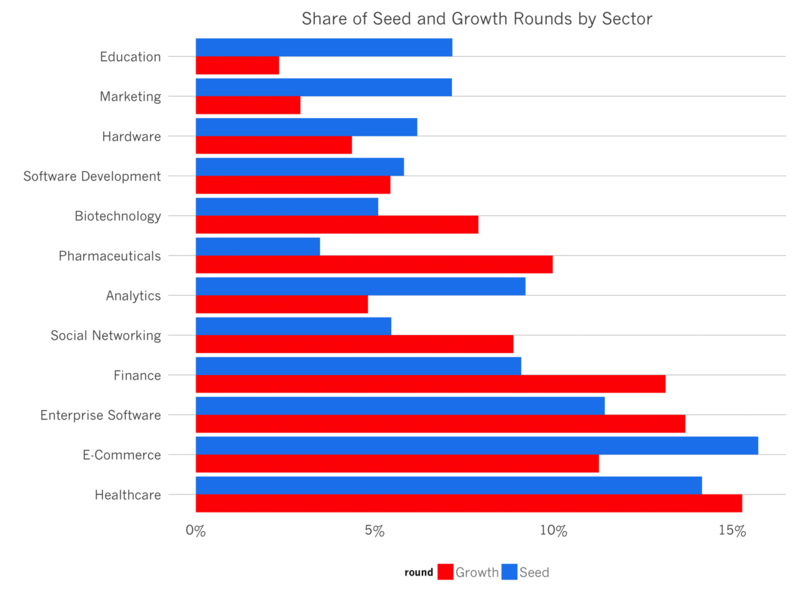 Most striking is the disparity with marketing and education companies who fetch substantial seed investment dollars but see only about 1⁄3 as many growth dollars - indicating differences in preference of the early and later stage markets. The converse is true for analytics companies. This data shows which sectors are coming into and out of vogue with investors. Unfortunately, it doesn’t reveal which sectors will generate the best returns, or in which sector the next great startup will be built!